With sweet Roula, hotel manager! That day you could see 11 cruise ships!! Hi Jelena, beautiful photos!!! I love your dress! Love Santorini, is one of the better place to spend summer holidays! I went here many times and keep to like it as the 1st time! So, your coming back to reality, in our world :). You had a really amazing summer. I'm so so happy for you girl. always great style ! love that dress! we read ... and I wait on my blog!! I adore your dress, it's so cute. And I'm sad for you that you're leaving, that place is so beautiful. beautiful waves and beautiful sunset!! hi, hun! :) Thank u for your comment! :) what is hun? It must be so difficult bidding farewell to a slice of heaven. But you did have a great time there, and that's just wonderful. Am following you on Bloglovin too, hun. Would be great if you could follow me on that too. great pictures honey and you look beautiful! WOW!! Lovely pictures and lovely blog!! Wow, I thought you guys had moved there :) I bet it's so sad to leave such a gorgeous place! Safe travels back home! Awe! That stinks its your last day. Oh dear what I would give to be in Santorini, amazing pictures darling. I want to go to Santorini! wow these are so gorgeous they look fake!! Such an amazingly gorgeous place! What gorgeous scenery! Of course, there is nothing as pretty as you. Your outfit is just amazing! I love the animal print. Rawr. WOW!!! That dress is fabulous!!!! It's sad to go back and leave such a great place! 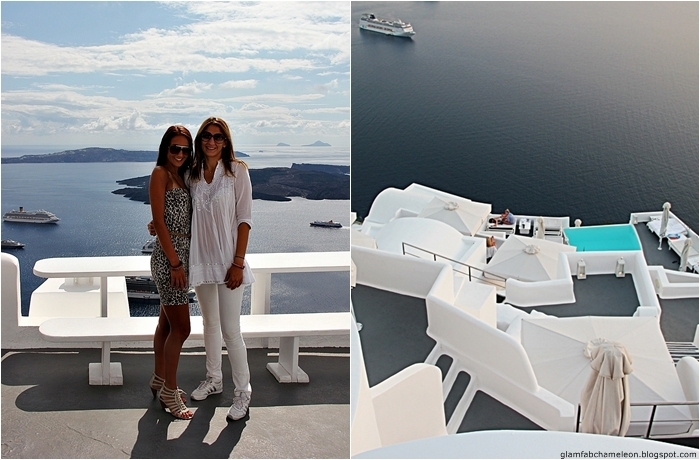 My memories about santorini are still vivid in my mind! That sunset is beyond gorge! And your look is fab as usual! that backgroud is simply gorgeus! Gorgeous I mean stunning photos and of course you look absolutely FAB DOLL. this looks fabulous! awesome views, awesome outfit! wish i could have been there! That place is beautiful!! And you look amazing!